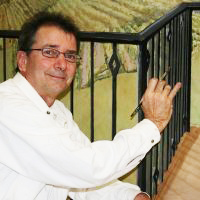 Looking for a decorative painter in New Jersey or Pennsylvania? We understand that it can be difficult to find local painters or a decorative painter in the Bucks County, Delaware County, Montgomery County and NJ area that you can fully rely on to make your decorative painting ideas a reality. We pride ourselves on offering highly talenteddecorative painters and local painters that can provide gorgeous and detailed hand painted murals, gilding andgraining to homes and businesses across the Delaware County, Bucks County and Montgomery County, Pennsylvania. Designer Houses (1994-present) Contributor in Bucks County and Carynwood designer houses. Society of Gilders (SOG): (1997-present) Exhibited at Gibbs Museum in Charleston, NC. Michael Colkett receiving the PDCA’s PIPP award and being congratulated by Ross O’Neal. Ross has been Michael’s main teacher for many years. First place in national PDCA Picture It Painted Professionally contest in the faux finish category. 2007 – Work chosen to be part of decorative painting exhibit for spring show at M.C.Escher Museum in the Hague, Netherlands. At Colkett Painting, our local painters are dedicated to providing businesses and residents of Bucks County,Montgomery County and Delaware County, PA with premier customer service and unique one of a kind decorative paintings. For more information on our decorative painters, please view our portfolios and contact us today! Gert-Jan Nijsse’, Netherlands (2001): Master class in graining and marbling. Patrick Kirwin, Alexandria, VA (2001 and 2003): Training in trompe l’oeil and mural design. Pascal Amblard, Paris (2001) : Training in trompe l’oeil and mural design. Salon 2010 – Atlanta ,GA. ,USA..